I wake up at 8am to brush my teeth, still bleary-eyed, and wait for my grandfather to return with breakfast. Sometimes, it’s nasi lemak, paired with whatever else is good that day – perhaps roti canai, wonton noodles, or the special curry noodles that are available only once every fortnight. After a while, and maybe a game of xiang qi - Chinese chess - we make our way to the island. Looking out the windows, I see the beautiful bridge, and the two small islands I watched grow from just spots of sand to their current size. Our usual route goes against the traffic, and soon brings us to our favourite laksa stall in Air Itam. Having slurped the delicious noodles, we head to a street nearby, ambling past stores for some cold cendol by the landmark Komtar Tower to find respite from the hot weather. Then we drive past Magellan road, looking out for durians, knowing full well our favourite species comes into season only from June to August. Along the way, we pick up some of our favourite delicacies, such as dodol, Tambun biscuits, and sesame oil. If time permits, we visit one of my dad’s best childhood friends, whom I call Pakcak, and his family. Stomachs satisfied, we take a slow drive back to the island. Just a few hours later, it’s time to eat again, and dinner usually consists of tua pan, a noodle dish available only in Penang. That’s what my parents and I do each time we go there. Trips such as these formed a large part of my Malaysian childhood, and continue to do so. It’s a kind of childhood one can only have in this country, where cultures mingle, and it is considered normal to have food from various ethnicities in a single meal. People are friendly here and neighbours invite each other, not just to their own gatherings and celebrations, but their relatives’ festivities as well. We go to each others’ homes for open houses, kenduri, and a host of other celebrations to enjoy each other’s company. Also, we never run out of topics to talk about. This seamless integration of different races is what makes us 1Malaysia. For Malaysians, a formal outfit does not only mean suits and dresses. It includes batik, along with the traditional clothes of our other ethnic groups. Batik isn’t a type of dress; rather it refers to the fabric design where both men and women can wear it. It uses the wax-resist dyeing technique to create designs. The technique is practiced all around the world, including Indonesia, Africa, China, as well as other parts. Though it is not known when or how batik started in Malaysia, there is evidence that it was influenced by the Javanese batik. 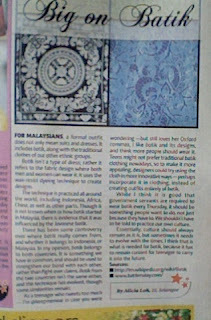 There has been some controversy over where batik really comes from, and whether it belongs to Indonesia, or Malaysia. 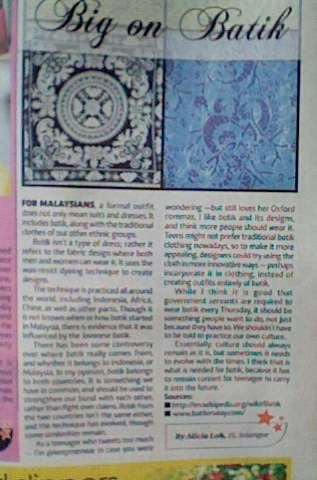 In my opinion, batik belongs to both countries. It is something we have in common, and should be used to strengthen our bond with each other, rather than fight over claims. Batik from the two countries isn’t the same either, and the technique has evolved, though some similarities remain. As a teenager who tweets too much — I’m @keepmenear in case you were wondering —but still loves her Oxford commas, I like batik and its designs, and think more people should wear it. Teens might not prefer traditional batik clothing nowadays, so to make it more appealing, designers could try using the cloth in more innovative ways — perhaps incorporate it in clothing, instead of creating outfits entirely of batik. While I think it is good that government servants are required to wear batik every Thursday, it should be something people want to do, not just because they have to. We shouldn’t have to be told to practice our own culture. Essentially, culture should always remain as it is, but sometimes it needs to evolve with the times. I think that is what is needed for batik, because it has to remain current for teenager to carry it into the future.